Take a few minutes today to renew your baptismal promises. Prison Ministry for Traditional Catholics: “I Was in Prison, and You Came to Me"
As Catholics, we have all heard the words of our Lord, “I was in prison, and you came to me” (Matthew 25:36) throughout our lives. Whether it was in the context of the corporal works of mercy in catechism class or during a sermon, most of us can in all likelihood recall these words of our Lord. 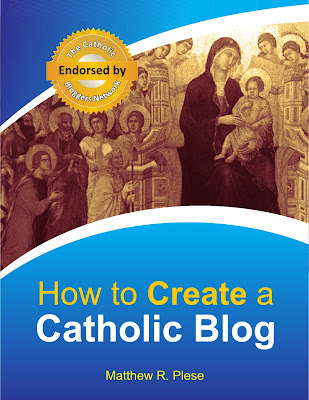 As Catholics today in the midst of a great confusion not only in the modern world but also in the Church, it’s important to re-focus ourselves on the basics of the Faith. Whereas some churchmen have the propensity to add many complicating layers to the Faith, much of the Faith is straightforward. 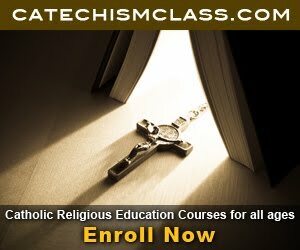 Think of the simplicity and clarity of the Baltimore Catechism. Spend time re-grounding yourself in this treasure of the Faith. And that re-grounding starts now. The Baltimore Catechism succinctly summarizes the corporal works of mercy: "The chief corporal works of mercy are seven: 1.To feed the hungry, to give drink to the thirsty, to clothe the naked, to ransom the captive, to harbor the harborless, to visit the sick, and to bury the dead" (Baltimore Catechism #3, Q. 819). And for completeness, the spiritual works of mercy are also summarized a few paragraphs earlier: “The chief spiritual works of mercy are seven: To admonish the sinner, to instruct the ignorant, to counsel the doubtful, to comfort the sorrowful, to bear wrongs patiently, to forgive all injuries, and to pray for the living and the dead” (Baltimore Catechism #3, Q. 813). 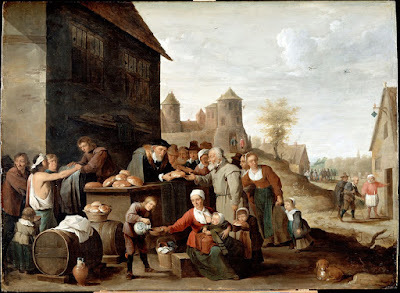 In the modern world, it would be rather unusual for us to be able to, strictly speaking, “ransom captives,” since the modern justice system does not permit ransoming in way in which our ancestors in the Faith did. 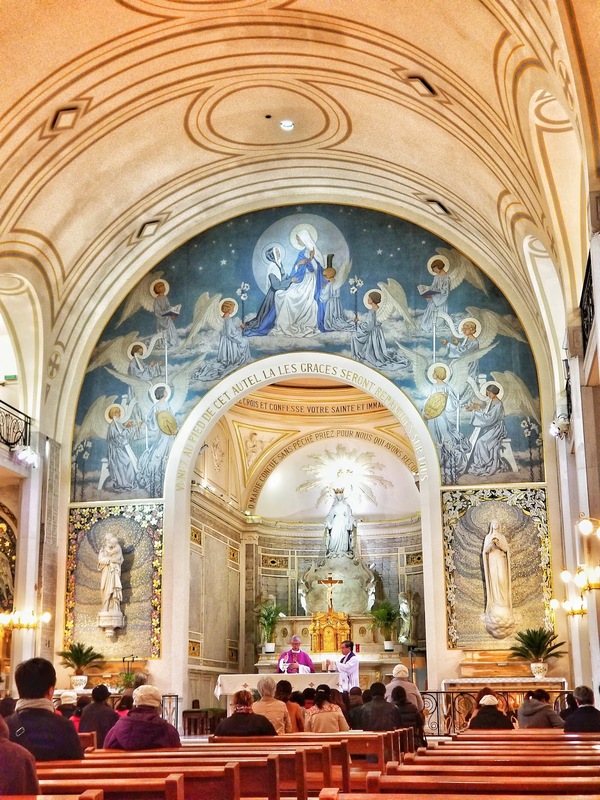 In times past, our fathers in the Faith joined in both spiritual support and financial support orders like the Mercedarians, or Order of the Blessed Virgin Mary of Mercy, which was founded in 1218 in Spain by St. Peter Nolasco to redeem Christian captives from their Muslim captors. But what are we to do? Is the Lord’s command to visit those in prison defunct? Far from it! The words of the Lord as recorded in the Holy Gospels remain for all times: “Come, ye blessed of my Father, possess you the kingdom prepared for you from the foundation of the world. For I was hungry, and you gave me to eat; I was thirsty, and you gave me to drink; I was a stranger, and you took me in: Naked, and you covered me: sick, and you visited me: I was in prison, and you came to me. Then shall the just answer him, saying: Lord, when did we see thee hungry, and fed thee; thirsty, and gave thee drink? And when did we see thee a stranger, and took thee in? or naked, and covered thee? Or when did we see thee sick or in prison, and came to thee? And the king answering, shall say to them: Amen I say to you, as long as you did it to one of these my least brethren, you did it to me” (Matthew 25:34-40). Whereas in times past, it was more commonplace to ransom or physically visit strangers in prison, it is still possible today to observe our Lord’s command through Catholic prison ministry. Prison ministry is an often forgotten manner of observing the works of mercy. Yet, prison ministry offers a truly unique opportunity to intersect both the corporal and the spiritual works of mercy. Through effective prison ministry, we can both provide for the physical needs and human interaction that prisoners need and for the spiritual needs of their souls. Writing of the prisoners, Mr. Banschbach continues, “Most, but not all, are sincere in their desire to learn about the Faith and make up for lost time. They soak up the information.” Indeed, these souls – like the souls of our children – are in need of the Divine Word and the life-giving Sacraments. Angelus Press echoes these sentiments and the grave need these imprisoned souls need today. How can our hearts not be heavy when we hear their call for help: “Never has the call to visit the sick and imprisoned and to instruct the ignorant been so important. These are the forgotten souls of society and desperately need help. Many of these men and women desire to spend their time reconciling with Christ and His Church, and in helping those souls around them find the truth. They are surrounded by the enemy and have no means to fight, and often not even the tools to defend themselves” (Angelus Press: Our Apostolate). While we cannot help them from their physical prison, we can free them from the more serious spiritual prison that is forged by their sins. And whereas only a priest may absolve them, baptize them, or administer the Lord’s Body and Blood to them, we can still have a hand in this war against the devil to save these souls. But how can we help? If our Lord’s words are still true and if the call to help these prisoners is of paramount concern now, we should all be asking ourselves what we can do to help them lest we hear those words, “Depart from me, you cursed, into everlasting fire which was prepared for the devil and his angels....I was a stranger, and you took me not in: naked, and you covered me not: sick and in prison, and you did not visit me...Amen I say to you, as long as you did it not to one of these least, neither did you do it to me" (Matthew 25:41,43,45). Thankfully, there is a way for those of us who live lives in the world to help. First and foremost, these imprisoned souls need our prayers. Once a month offer a spiritual Communion for the souls in prison. 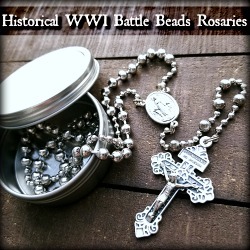 And once a month, offer one of your Rosaries for the souls in the prison system to know the One True Faith and to ultimately preserve in grace until death. And finally, let us add these souls to our daily prayers. As we pray for the souls in purgatory, for our friends and family, and our other concerns in our morning prayers, let us just add an invocation for these souls each day. Secondly, let us assist these souls in their spiritual formation. Angelus Press has a prison ministry program whereby they donate their books at cost to the prisoners who need them. The work is entirely for the souls of those in prison and the organization does not make any money off of the donations. Please join me in visiting the Angelus Press Website and making a donation for this most noble cause. Also, you may make donations of books, pamphlets, holy cards, or religious pictures directly to Mr. Banschbach at St. Michael’s Catholic Church, Prison Apostolate, c/o Michael Banschbach, 1703 W. Storey, Midland, Texas 79701. And finally, let us do what we can to prevent these crimes from occurring. Many of the souls in prison today are there due to bad choices they made. Yet, many of these souls had a poor family life – many of the young men in today’s prison system did not have a father figure in their lives. Doing what we can to pray for and support the youth in our communities will help reduce the number of souls that make it to the criminal justice system. Above all, let us place our work in this work of mercy under the intercession of the Most Blessed Virgin Mary, St. Daniel of Padua, St. Maximillian Kolbe, and St. Peter Nolasco. May they pray for us and for all souls who prison today who need sanctifying grace. We often hear today of very concerning actions taking place in the Church - even in Rome itself. And while it is important that we study these materials in detail since heresy is often a drop of poison in a good cup of wine - rather than all rotten truths - we need to raise our mind to more of a 30,000-foot overview at times. 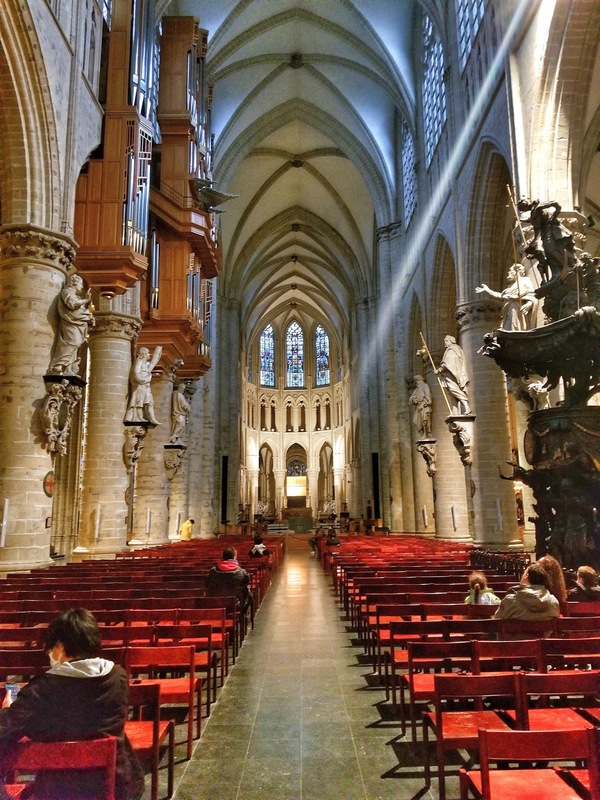 In failing to do so, we get so involved in the details that we forget what we really need to do to help save the Catholic Faith from the rapid protestantization occurring among the faithful today. Let's focus on the Top 20 Actions Holy Mother Church needs to make. Let us pray and work for these to occur. 1. The Restoration of the Traditional Latin Mass - the Mass of All Times - in all Latin Rite parishes and the abolition of the 1969 Rite of Mass. 5. An immediate reduction in annulments which have become a "get out of marriage free" card. 8. Immediately cease false ecumenism and resume true missionary work, since we hold that outside of the Catholic Church there is no salvation. Ecumenism downplays Christ. 18. 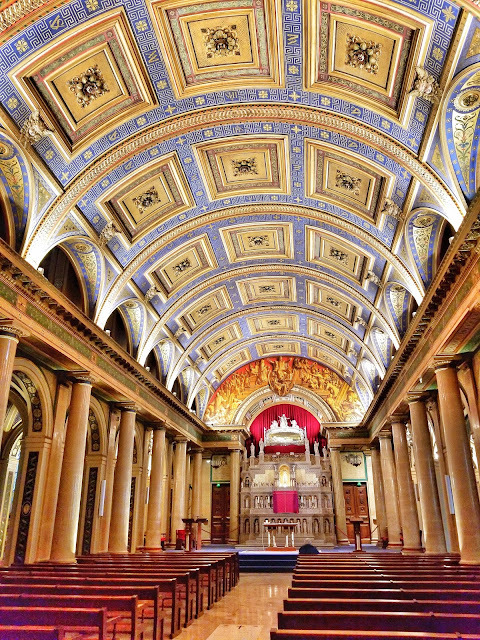 Restore the Church to the glory she had before the revolution that occurred at Vatican II. Let us pray and actively work to achieving all of these. Lord have mercy! 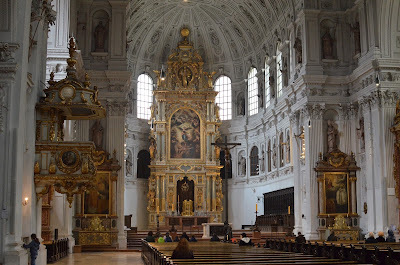 Image Source: St. Michael Church in Munich, Germany (c) A Catholic Life Blog, 2017. Probably the most beautiful Ave Maria I've ever heard. "He saith to them: Cast the net on the right side of the ship, and you shall find. They cast therefore; and now they were not able to draw it, for the multitude of fishes. That disciple therefore whom Jesus loved, said to Peter: It is the Lord. Simon Peter, when he heard that it was the Lord, girt his coat about him, (for he was naked,) and cast himself into the sea. But the other disciples came in the ship, (for they were not far from the land, but as it were two hundred cubits,) dragging the net with fishes. As soon then as they came to land, they saw hot coals lying, and a fish laid thereon, and bread. Jesus saith to them: Bring hither of the fishes which you have now caught. Simon Peter went up, and drew the net to land, full of great fishes, one hundred and fifty-three. And although there were so many, the net was not broken" (John 21:6-11). This passage, which is read in the Traditional Mass on Easter Wednesday is unique for many reasons. One of which is the rather strange precision – 153 fish. Typically, when we read the Scriptures, we read 12, 40, 144, or other large and symbolic numbers. The number 153 is strangely precise among all Scripture passages in the entire Bible. And yet, it is not without a deep meaning as explained by the Church Fathers. St. Augustine says: The catch of fish tells us of the salvation of men, but man cannot be saved without keeping the 10 commandments. But, on account of the fall, man cannot even keep the commandments without the help of grace and the 7 gifts of the Holy Spirit. Moreover, the number 7 signifies holiness, since God blessed the 7th day and made it holy (Gen 2:3). But 10 plus 7 equals 17, and if all the numbers from 1 to 17 are added together (1+2+3…+17), they equal 153. Hence, the 153 fish signify that all the elect are to be saved by the gift of grace (7) and the following of the commandments (10). St. Cyril breaks 153 into 100 (the great number of gentiles to be saved), plus 50 (the smaller number of Jews to be saved), plus 3 (the Trinity who saves all). Others follow St. Cyril, but modify this as follows: 100 (the multitude of married lay faithful in the Church), plus 50 (the many faithful who commit themselves later in life to continence either living as widows or living with their spouse in a brother-sister relationship), plus 3 (the precious few who commit their whole lives to celibacy as virgins) equals 153 (the whole Church taken together as a single body). Perhaps most convincing of all is the theory of St. Jerome: It was thought at that time that there were only 153 species of fish in all the world. 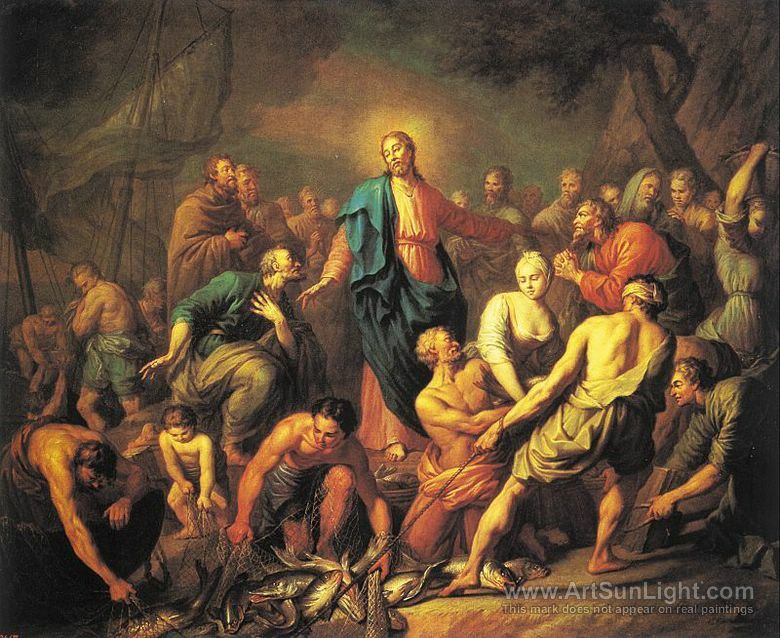 Hence, the disciples caught 153 fish, signifying that men of every class and time would be saved through the Gospel. I personally also find the most likely explanation to be the one offered by St. Jerome. And rather than merely admiring the hidden meaning here, we should realize it impresses on us – lay Catholics and consecrated religious alike – the need to use our resources and time to bring the Faith to other souls. Through our efforts of planting seeds, admonishing sinners, correcting the doubtful, and explaining Traditional Catholic teaching to the erring we bring us closer to the time when all nations and peoples will be united in the One, Holy, Catholic, and Apostolic Church – the Barque of Peter – the Catholic Church. 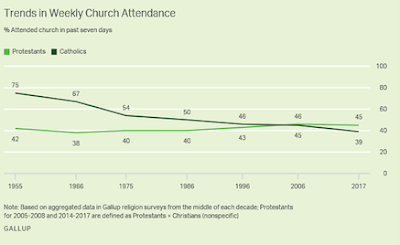 We knew that younger Catholics were going to church in fewer numbers than in the past, but what is new about this Gallup poll is the decline among older Catholics. 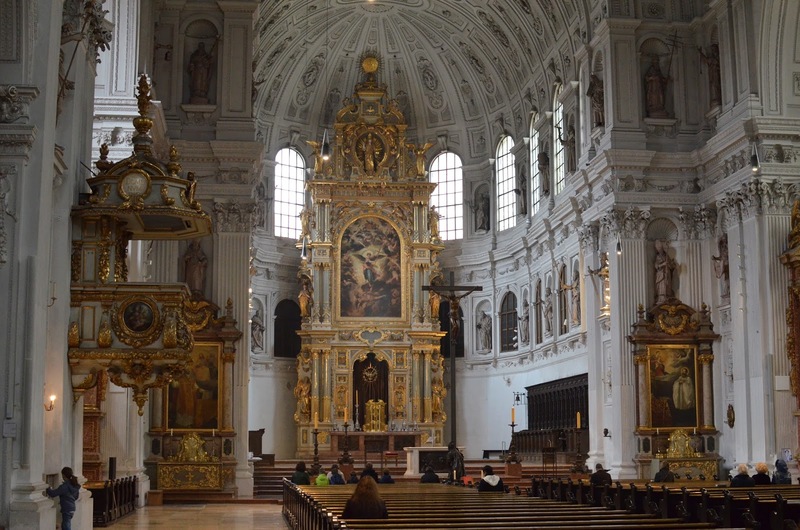 Overall, only 39 percent of Catholics say they attend church weekly, and among those aged 60 and over the figure is 49 percent. This means that "for the first time, a majority of Catholics in no generational group attend weekly." 4) The ascendancy of moral relativism—the denial of moral absolutes— has engulfed society. The nation's cultural elites are responsible for this outcome, including, sadly, some religious leaders. There is no iron law of history, except on the blackboard of ignorant professors, so a reversal of events is possible. But a culture doesn't change by happenstance: it takes a determined effort on the part of the nation's elites to reverse course. Regrettably, that day has yet to come. In the back of your 1962 Daily Missal is likely a section for feasts in certain places and for certain congregations. These feastdays are not on the Universal Church but are unique to certain dioceses or religious orders. Yesterday on April 8th was one such feast - the Feast of Blessed Julie Billart. Despite being called Blessed in the 1962 Missal, she was subsequently canonized in 1969. St. Julie Billiart was confined for 22 years to her bed due to paralysis. Miraculously cured, she founded the Institute of the Sisters of Notre-Dame for the care and Christian education of poor girls. 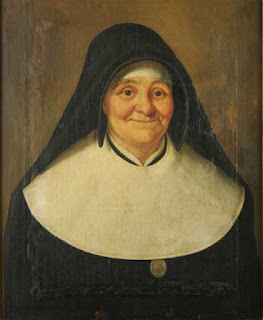 St. Julie Billiart was born in 1751 and died in 1816. At a young age she released her love was for teaching and she carried on that mission throughout her life, and the Congregation she founded continues her work. Continuing the account of my travels last month, after finishing five days in Netherlands and Belgium, I arrived via train in Paris at night on March 7th. Paris is the home to a sadly forgotten Catholic Faith but one that is still seen in some remnants. 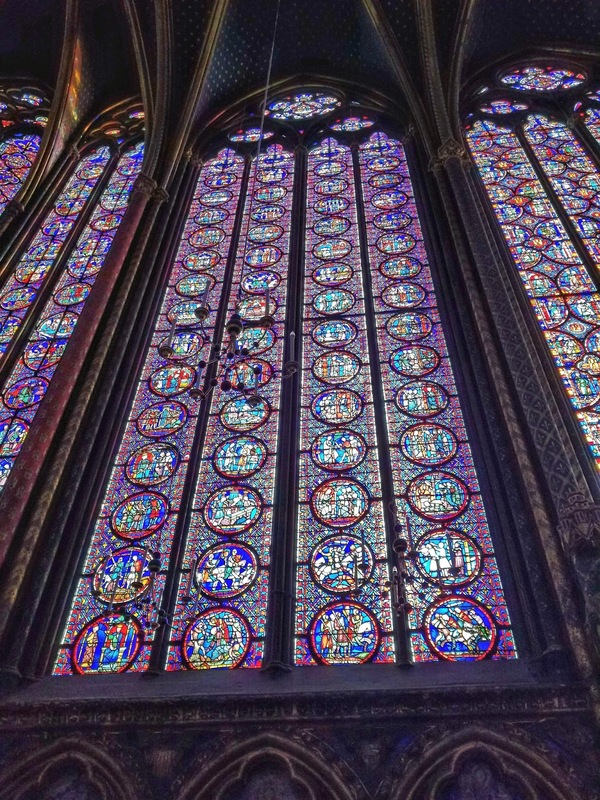 On the morning of March 8th I started my pilgrimage to Paris. 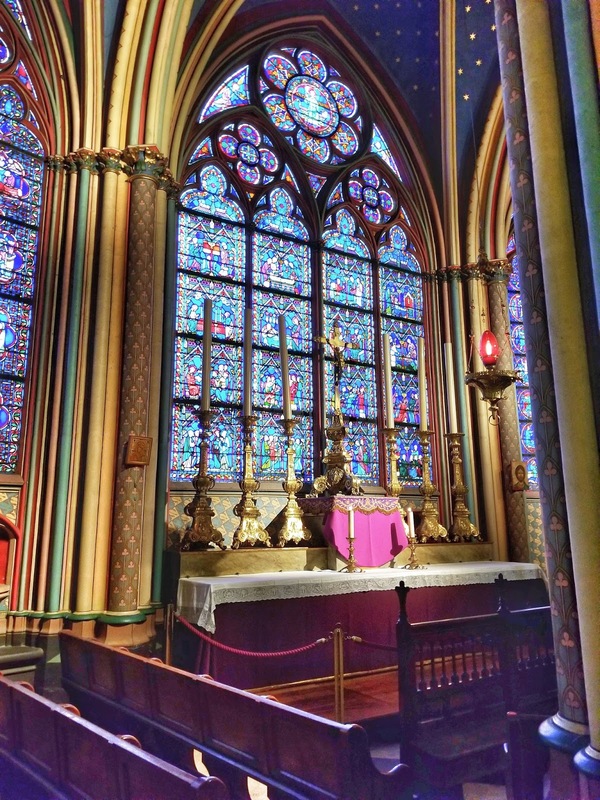 I started at the most quintessential Catholic Church in France: Notre Dame. 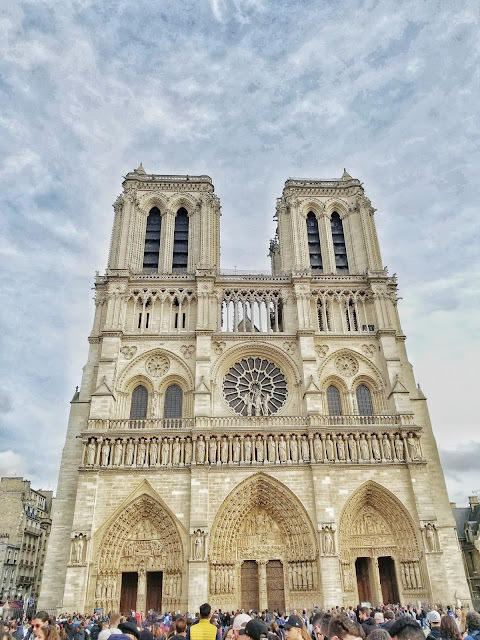 Completed in 1345 - nearly 200 years after the groundbreaking - Notre Dame is a beacon of hope to those who pray and work for a restoration of Catholicism in France. The Cathedral suffered serious damage in the 1790s when - like many French churches - it was desecrated by the French Revolutionaries. Thankfully, an extensive restoration began in 1845 and today the Cathedral holds beautiful art and many treasures including the relic of the Crown of Thorns, a fragment of the True Cross, and one of the Holy Nails that pierced our Lord Jesus Christ. 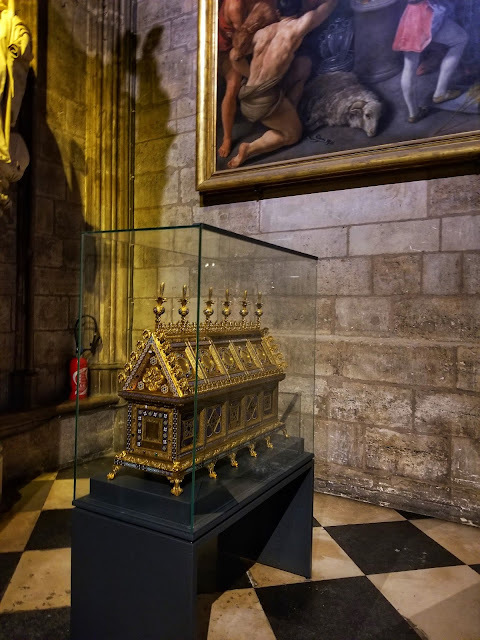 The relics of St. Genevieve, patron of France. 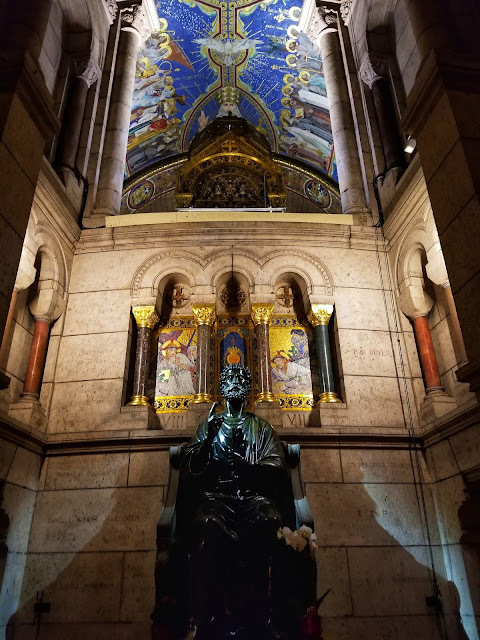 After visiting Notre Dame and exploring the city despite the persistent rain, I made my way north and concluded the day with Eucharistic Adoration in Sacré-Cœur, a truly breathtaking Basilica. 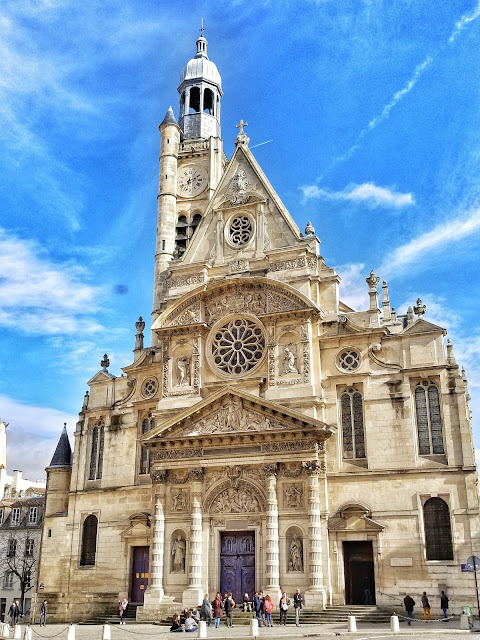 Unlike many of the Cathedrals and Basilicas in France, this one is relatively new as it was completed in 1914 and dedicated after WWI. Sacré-Cœur is a monument which serves as a national penance for the defeat of France in the 1870 Franco-Prussian War and the socialist Paris Commune of 1871. 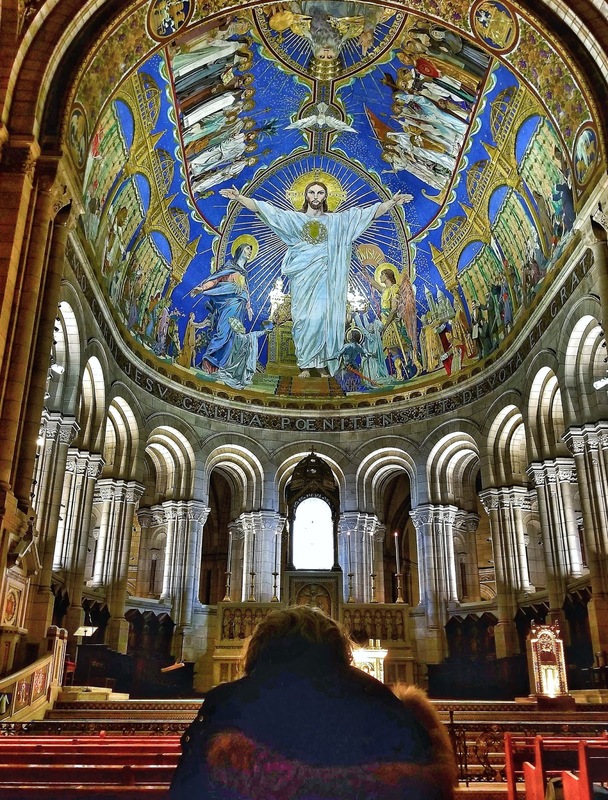 Sacré-Cœur serves as an embodiment of conservative moral order, publicly dedicated to the Sacred Heart of Jesus. 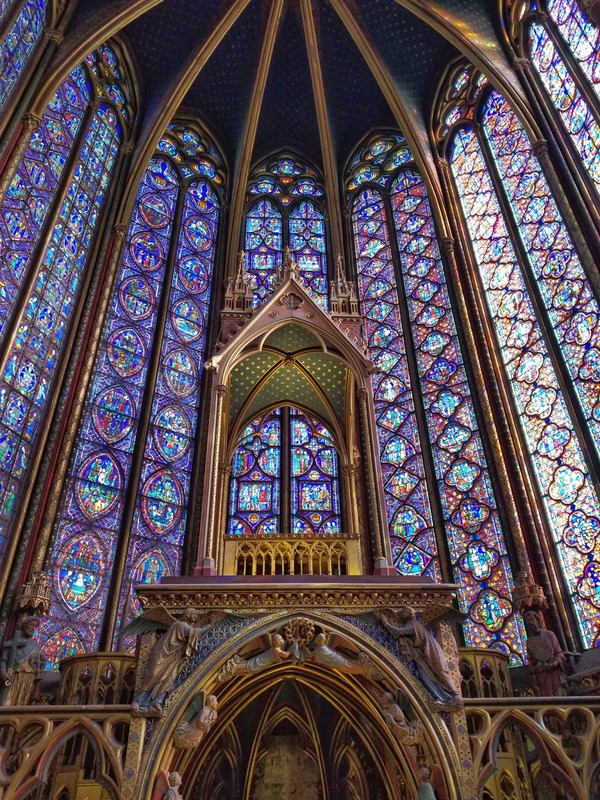 Those familiar with French history will know of the desecration of many French churches including the destruction of relics, icons, paintings, and whole buildings in the French Revolution. In fact, thousands of Catholics were killed for the Faith. Next to the Pantheon - a church which has been desecrated and to this day still serves as a monument and burial chamber for leading atheistic revolutionaries - is the Church of Saint-Étienne-du-Mont. 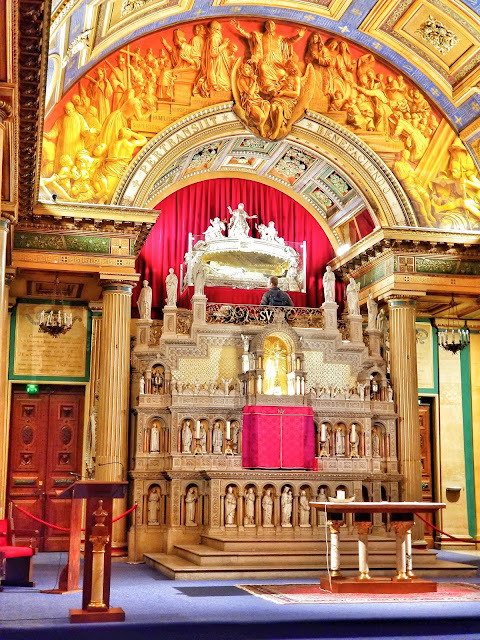 Inside Saint-Étienne-du-Mont are some of the relics of St. Genevieve which were not destroyed. I was able to venerate those sacred relics. 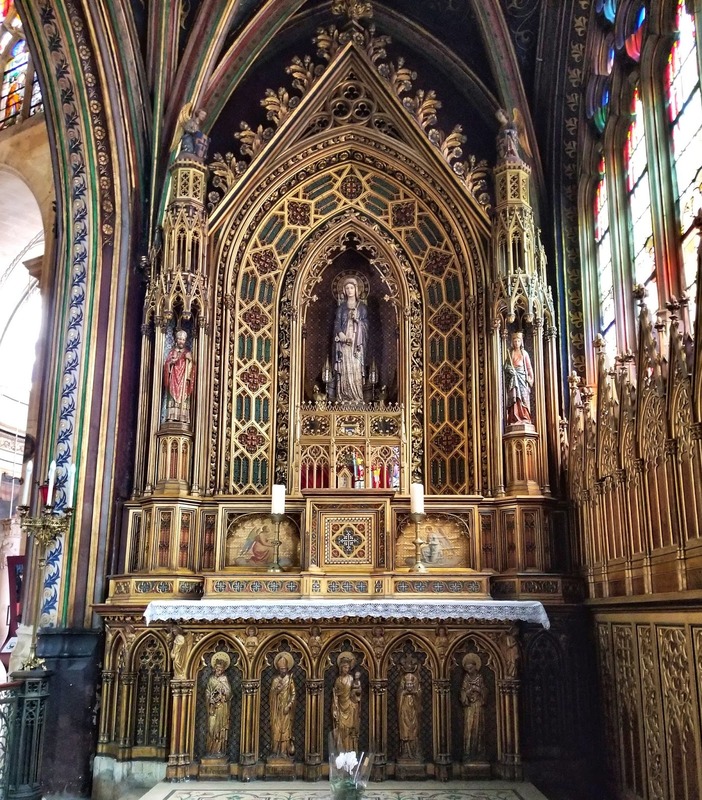 Taking advantage of the favorable weather, I traveled across town to Saint Chapelle - the personal chapel which St. Louis IX built to contain the Relic of the Crown of Thorns. The holy saint spent 100,000 livres to purchase the relics and return it to the hands of a Christian nation. By contrast, the beautiful chapel cost 40,000 livres to build and glaze. This served for me a good reflection point - do I do all that I can to bring glory to God? Do I sacrifice enough? The chapel was built in 1815 and was dedicated to the Sacred Heart of Jesus. In 1830 it was privileged with the extraordinary events of the apparitions of the Blessed Virgin to Sister Catherine Labouré that marked it forever. 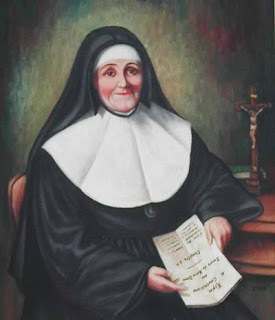 Heaven came down to earth… Between July and December 1830 Sister Catherine, a young Seminary Sister (novice) of the Daughters of Charity, received the extraordinary favour of conversing with the Virgin Mary on three occasions. In the preceding months Catherine had the privilege of other apparitions. Saint Vincent de Paul showed her his heart. While at prayer in the chapel, Catherine saw, on three successive days, the heart of Saint Vincent in three different colours. The heart first appeared white, the colour of peace; then red, the colour of fire; and then black, an indication of the misfortunes that would come upon France and Paris in particular. Soon afterwards, Catherine saw Christ present in the Eucharistic host. “I saw Our Lord in the Blessed Sacrament all the time of my seminary except the times when I doubted.” On June 6, 1830, feast of the Holy Trinity, Christ appeared as a crucified King, stripped of all his adornments. July 18, 1830, the eve of the feast of Saint Vincent whom she loved so much and whose heart she had seen overflowing with love, Catherine prayed that, through his intercession, her desire to see the Blessed Virgin would finally be fulfilled. At eleven-thirty at night, she was called by name. A mysterious child was at the foot of her bed and asked her to get up. “The Blessed Virgin is waiting for you.” Catherine dressed and followed the child who was “bringing rays of brightness wherever he passed.” Having arrived in the chapel, St. Catherine stopped near the chair used by the priest in the sanctuary (current location of the statue of Saint Joseph). She then heard a sound “like the rustle of a silk dress.” Her little guide said, “Here is the Blessed Virgin.” She hesitated. But the child repeated in a stronger tone of voice, “Here is the Blessed Virgin.” In a single bound, Catherine was at the feet of the Blessed Virgin, seated on a chair and rested her hands on the knees of the Mother of God. “There, a period of time passed, the sweetest of my life. It would be impossible for me to say what I experienced. 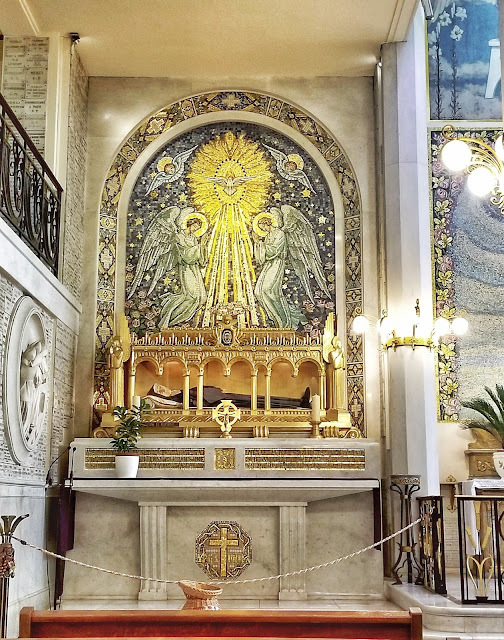 The Blessed Virgin told me how I should behave towards my spiritual director and also several other things.” The Blessed Virgin pointed to the altar where the tabernacle was and said, “Come to the foot of this altar. Here, graces will be spread over all who ask for them with confidence and fervour.” A difficult mission was announced as well as a request for the establishment of a Confraternity of the Children of Mary. Father Aladel would accomplish this request on February 2, 1840. 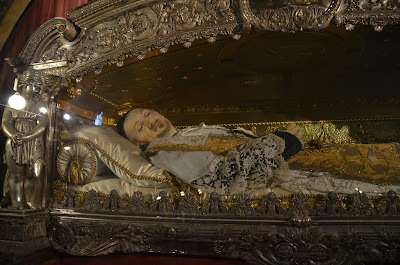 The Body of St. Luisa of Marillac. She was the co-founder, with Saint Vincent de Paul, of the Daughters of Charity. And at last, my final stop was the Shrine of St. Vincent de Paul which is located just blocks from the Miraculous Medal Chapel. There I was able to venerate and pray before his body. It was an experience that will remain with me for the rest of my life! Thank you for all of your prayers as I made this pilgrimage in Europe. I prayed for the intention of all of my readers and benefactors. And I continue to hold them in my prayers. A great video for this Easter Week as we see the connection of St. Patrick's missionary work to Easter. Whenever I read the accounts of St. Patrick’s work amongst the Irish I am reminded of the actions of Holy Moses in the Old Testament. As Moses went in the darkness of Egypt and faced a pagan pharaoh and his demonic magicians, so Patrick went to Ireland and faced pagan kings and Druid sorcerers. A mortal combat between life and death…between the light and darkness …between truth and falsehood…between a worker of true miracles and the performers of lying wonders…between Christ and the devil. Moses would be the good Lord’s instrument in bringing all the tribes of Israel out of Egypt. And Ireland would become the only country in the world that entirely owes its conversion to the work of one single man, namely, St. Patrick. As Moses went up Mt. Sinai and received the revelation of the law after much fasting, so St. Patrick had his own Lent of forty days spent on top of a mountain known as Croagh Patrick…the Mt. Sinai of Ireland…where the saint could look over the Island on one side and the Atlantic Ocean on the other. And from these heights, St. Patrick stood in the breach like Moses and obtained from the good Lord heavenly promises, including a remnant in Ireland that would always maintain the Faith and even the promise of St. Patrick being given the privilege of judging the Irish people and those of Irish descent at their deaths. On that Mountain of Croagh Patrick, the saintly bishop blessed the land on Holy Saturday and, having descended, Patrick offered Holy Mass for the people on Easter Sunday. But it is interesting that the great work of conversion in Ireland began on the night of the Resurrection…on Easter Vigil with the Easter Fire.